Now I’m aware that putting up an image like this does potentially risk an outbreak of panic. If you aren’t already concerned about globalisation, ageing workforces, declining productivity, the war for talent, millennials, managing virtual teams, too much connectivity and too much distraction then perhaps you are now. I’m fairly sure that artificial intelligence is creating more anxiety than excitement in most quarters too. But relax. Don’t panic. I’m not saying that AI isn’t an issue. It is. A big one. But we are inventing this technology and we, as individuals, organisations and society as a whole, remain in control of it. If we don’t like where AI is going, we should do something about it. But that’s not why we should relax. We, and especially HR Directors, should relax because AI will never do what most of us do. AI can do almost anything humans do, but with four critical exceptions in my view. 1.AIs can’t invent. They never will. Not at a fundamental level. AIs can paint, but they’ll never invent Cubism. AIs can write music and plays, but they’ll never be Mozart or Shakespeare. They’ll never be Steve Jobs or Elon Musk either. 2.AIs can never be truly empathetic. They can never have true emotional intelligence. They can fake it and the movie called Her is a good example. So too is a robotic seal called Paro that’s used in care homes. But AIs know nothing of the human hearts and never will. And without empathy you cannot effectively lead other people. 3.AIs can’t inspire humans. We can fully automate hiring and firing if we choose, we can use AI to spit out an endless deluge of data and workplace analytics, but I cannot see a future where humans will willingly follow AIs with a smile on their face and a spring in their step. 4.AIs contain computer code, not moral code. This has to be programmed by humans. AIs know nothing of fairness either. I could talk about the moral bankruptcy of Silicon Valley at this point, but I’ll spare you the sermon. So that’s AI. 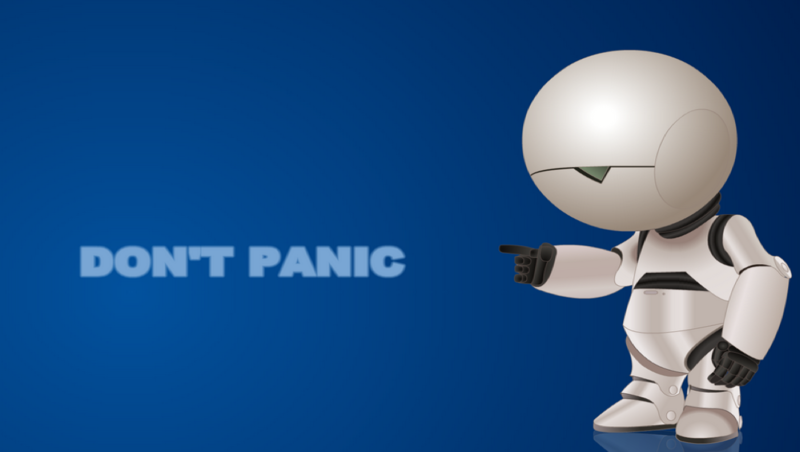 Don’t panic. But I have something else on my mind. Back in 2014, a Gallup global poll found that almost 90 per cent (I’ll say that again – almost 90 per cent) of employees were doing jobs that they didn’t really like. Almost 90 per cent were either “not engaged” or “actively disengaged” from their work. Given that work is where we spend most of our time, most of our lives in fact, the mind truly boggles. Why might this be so and what might we do to fix this? Here are another 3 things to think about. 1.Management. There’s too much of it. We don’t trust people enough. Witness our ongoing obsession with offices. I’m a big fan of the physical office. Work is social and so are people and I don’t think you can create a winning culture 100% virtually. But offices are a physical manifestation of a command and control mentality that’s past its sell-by date in some instances. They are remnants of a feudal system. We need to knock down the enclosures. We need to relax the rules. I understand why factory workers need to go to a factory to get their work done, but why do knowledge workers? Why do people have to go to a fixed place of work 5 days a week, 9am to 5pm inside a building? Can’t we be a bit more flexible about how and when we allow people work? We need much more personalisation of work contracts and conditions. Employers have bought a slice of peoples’ time. Not all of it. If people are being paid to think, or solve problems involving other people, as they increasing are, they need to recharge themselves as well as their devices. Constant connection to the office is impacting physical and mental health and destroying relationships. It has to stop. Holidays should be compulsory. People shouldn’t be allowed to email or call people out of hours unless it’s a matter of survival. 3.Human intelligence. Are we not smart enough to see that we are being stupid? I’m referring to how we educate people and integrate them into the workforce. We are obsessed with tests that measure logic and memory. Why, when this is precisely what computers are so clever at? We are also obsessed with STEM. Is it because we feel it’s how you futureproof a workforce or a career? Similar mistake. Coding skills? I’ve met people that are inventing software that can write itself. But to invent things like this you need some level of creative intelligence alongside scientific skills. You need the science, but you also need the art and, as an aside, we should put these two disciplines back together where they started and where they belong. We should insist that art, music and design are key components of the national curriculum and should be given the same degree of funding and respect as all other subjects. The bedrock is the 3Rs, but above this should sit subjects that teach people how to think critically and creatively.Organisations have a big role to play here. Organisations should provide lifelong learning opportunities across all these areas.If AI really is where things are going I’d speculate that the future actually lies in the humanities. Most importantly of all, we need to value all forms of intelligence, especially the emotional intelligences. There are eight forms of intelligence, but we tend to only teach, measure or value one or two. We are obsessed with logical and perhaps linguistic intelligence, but tend to ignore the rest. This is troubling, partly because logical intelligence is the type most likely to be impacted by AI and partly because most jobs nowadays involve dealing with people, and people can be emotional and irrational to put it mildly. Machines, in my view, can’t navigate in this landscape. Only people can. AI can help here, hugely, but it cannot and should not replace people. If we fix all this, and especially if we start valuing what I’d term emotional work, then we will have a good chance to include the people that currently feel undervalued or valueless to organisations and to society at large. If we can show people that we care about this and are attempting to rebalance the thing we currently call work then there’s a good chance that the stress, anxiety and dissatisfaction that surrounds so much work will dissipate or disappear. If we give people the time and space to work with machines, not against them, we can invent a future in which people are paid for being human, not penalised for it. This entry was posted in AI, Work and tagged Future of Work, HR, Impact of AI on work. Bookmark the permalink.